Article first published as DVD Review: Two-Faced Woman on Blogcritics. Swedish actress Greta Garbo was one of the greatest talents of Hollywood’s golden age, transitioning smoothly from roles as a silent seductress to a bona fide movie star in the talkie era. She was also deeply eccentric, and at 36, she simply stopped acting, and never returned to the screen again for the rest of her life. Warner Archive has released her final film, Two-Faced Woman, in its burn-on-demand series, and while it’s certainly nowhere near a career-killer, it’s also not the most memorable note to go out on. The film was part of a short-lived experiment at MGM to transform Garbo into a comedic actress, a strategy that worked well for Ernst Lubitsch’s 1939 film Ninotchka, for which Garbo received an Oscar nomination. That film had the benefit of some gravitas thanks to its Soviet setting, not to mention the signature Lubitsch touch and a script worked on by Billy Wilder and Charles Brackett. 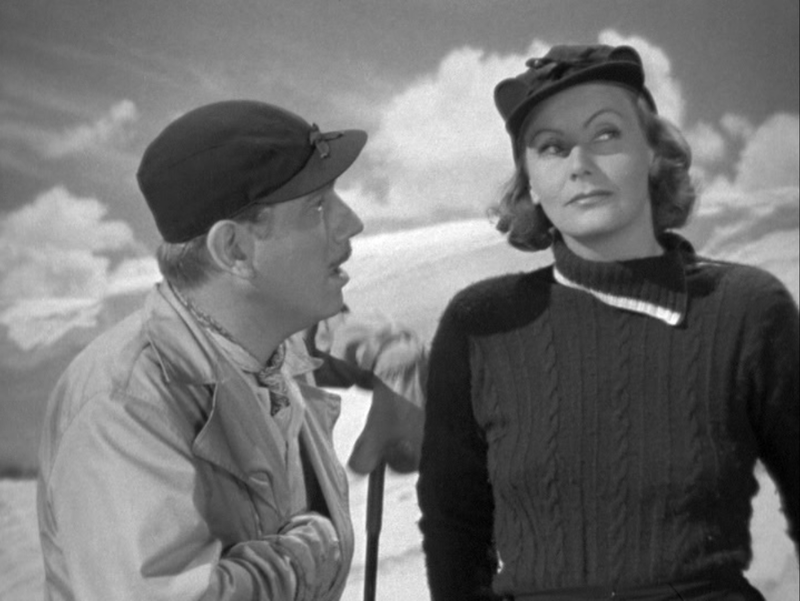 By contrast, 1941’s Two-Faced Woman seems incredibly insubstantial, and not in a light-as-air romantic way, but in a dull, plodding way that can’t even be saved by the talents of Garbo and Melvyn Douglas. Douglas stars as fashion magazine editor Larry Blake, a man vacationing in the mountains who has no interest in skiing until he spies instructor Karin Borg (Garbo). He’s initially rebuffed by her, but after a mishap on the slopes and a missing person search, the two return happily married. Soon enough, however, Blake announces his intentions to return to work into New York, much to the chagrin of nature lover Karin, who stays behind. But soon, without her husband’s knowledge, Karin travels to New York where she finds Larry starting to cozy up to Griselda Vaughn (Constance Bennett). In a test of loyalty, she decides to pose as her own fictional twin sister Katharine, a supposed fireball of sexual energy who never really gets to show much passion at all beyond a few mild double entendres. The film is undercut further by a plot insertion that allows Larry to discover the ruse almost immediately (apparently an insistence by censors nervous about a married man/sister-in-law flirtation). The film proceeds in typical mistaken-identity fashion, but has precious little to hang its hat on besides that tired narrative convention. That works in an Astaire-Rogers picture where virtuoso dancing and endless charm are the real attractions, but here, there’s almost nothing but endless scenes of Garbo attempting to pull off a fiery screwball heroine. There is no denying that Garbo had charm, but it was of a more peculiar brand than this film calls for, and even in a lively scene where she performs a Latin-inspired dance number, it feels like the wrong vehicle for her. Directed by the dependable George Cukor, Two-Faced Woman is competently produced on every level, but lacks the spark to make its well-trodden narrative shine. Any Garbo film made available on DVD is a good thing, but this is not her finest hour. The film has not been remastered, but the print used in creating the DVD was in pretty good shape, with only minor marks and scratches. This Warner Archive entry comes with the film’s theatrical trailer. I am happy of course to have these films available on DVD. However it feels a little like crumbs to the dogs. They are not remastered, they have no subtitles, no extras, and one even has audience laughter in the background (LOVE I think, outrageous). I personally would be willing to pay top dollar for a first class edition of every Garbo film on DVD and find these less than stellar releases a dishonor to Garbo and her fans.